Use construction-set principle video surveillance software to configure system you exactly need, simply and quickly. From simple to 100+ cameras large and multiple server systems. Multi-features software for both beginners and professionals. Modern interface design and touch-screen compatible control. Easy to start, no installation or admin rights required: Xeoma auto-detects all your cameras and starts to work immediately after launch. Hundreds of brands and models of IP cameras, Wi-Fi, USB, H.264, MJPEG, MPEG4, and PTZ cameras supported. Work and control remotely on Windows, Linux, Mac OS machines, mobile devices, even behind firewalls. 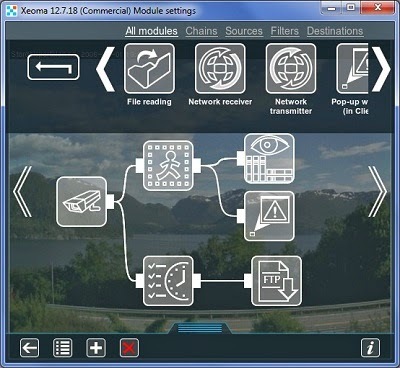 Even having no cameras, use Xeoma to record your screen captures and enjoy watching world internet cameras. Spy on your co-users: use stealth mode. Allow operators to watch cameras, but not access settings: use protected mode. Store footage locally into cyclic archive with built-in smart video player or send videos to remote machines running Xeoma, web servers, email, save them to user-specified directories. Powerful motion detector allows to set up zones of any shape and size and adjust sensitivity level to avoid false detection of small, specific objects or animals. Use pre-record option to record video before event happens, or be notified by popping up Xeoma window when motion is detected. Scheduler allows to switch on any functionality at specified date and time. Xeoma will save you time, nerves and money! With surprisingly little effort, it turns your PC into a full-featured yet simple and enjoyable to work with video surveillance system. You can use Xeoma to keep an eye on your house or workplace while you're away, watch your child play or sleep, monitor employees' work, control babysitter or caregivers, have an eye on car or other valuables and much more! Get excited about powerful possibilities of Xeoma, get impressed with its price-to-quality ratio. Download it now free of charge - get the best for you and your safety!